From the most religious to the less devoted, everyone in Palermo loves Saint Rosalia, tenderly called “Santuzza”. Its huge statue placed on top of Mount Pellegrino overlooks the whole gulf and the city, and even those who haven’t been in a church for ages are happy to pay their respects to the Saint in this quiet and extraordinary point of observation. And on July 14th, the whole city respectfully stops and a sumptuous outstanding celebration starts, involving the whole citizenry including all authorities. It is said that Saint Rosalia rescued the city from a horrible plague: she appeared to a hunter in the woods of Mount Pellegrino, and told him where to find her remains and then to have them brought to Palermo and carried in procession throughout the city. After the procession, the plague actually ceased: from then on, the Saint started being venerated as the holy protector and patron saint of Palermo, thus replacing so much as four former patron saints (Saint Oliva, Saint Ninfa, Saint Agata and Saint Cristina). A huge and very heartfelt event, the Festino takes place on July 14th, the day before the religious celebrations of July 15th (still a non-working day for most businesses in the city). A first small celebration was held in 1625, and it became more and more sumptuous throughout the centuries: nowadays, it is one of the most spectacular artistic shows and parades in Sicily. 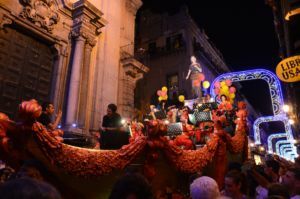 Great artists, performers and artisans are entrusted every year with the task of creating marvellous light effects on the Cathedral of Palermo, organising live shows, performances and dances (representing the last days of the plague in the city) throughout the historical centre and – of course, realising the cart upon which the statue of Saint Rosalia is placed to be carried around the main streets of the centre. The whole concept of the event is developed by following a different topic every year. On the night of July 14th, the finely-crafted cart starts from Palazzo dei Normanni and stops by the Cathedral, and then is carried along the whole “Cassaro” (the most ancient street of the city, founded by the Phoenicians), via Vittorio Emanuele, with a stop at the scenic Piazza Vigliena (or “Quattro Canti”, the four beautifully-decorated corners of the square) during which the Major pays its tribute to the Saint by placing a crown of flowers at its feet, then crosses Porta Felice and reaches the sea – a journey from death (the plague) to life, represented by the light of the marvellous fireworks greeting the Saint on the seashore together with live music. It’s a day worth living. And of course, it comes with a series of traditions: during the celebration days people eat the most popular recipes of the city – pasta with “sarde”, “babbaluci” (boiled snails with garlic and parsley), “sfincione” (typical street food similar to pizza), “purpu” (boiled octopus), and pedlars can be found around all the area of the parade selling “calìa e simienza” or “scacciu” (a mix of chickpeas and pumpkin seeds) as well as “pullanca” (boiled cob) and watermelon to freshen up a bit. Another typical ritual of the day: plenty of families start gathering in the “Foro Italico”, the seaside promenade of Palermo, since the early hours of the morning, with packed food (lasagne, pastalforno and more), in order to get the best seats to watch the spectacular fireworks. The parade is massively crowded and temperatures are usually pretty high in this period of the year, therefore we recommend you take plenty of water with you if you decide to follow the whole procession. If you are staying in one of villas in Palermo – Sicily or one of our stunning Sicily villas by the sea ; we recommend you to join the celebrations early enough, as plenty of visitors will be approaching the historical centre to attend the celebration.